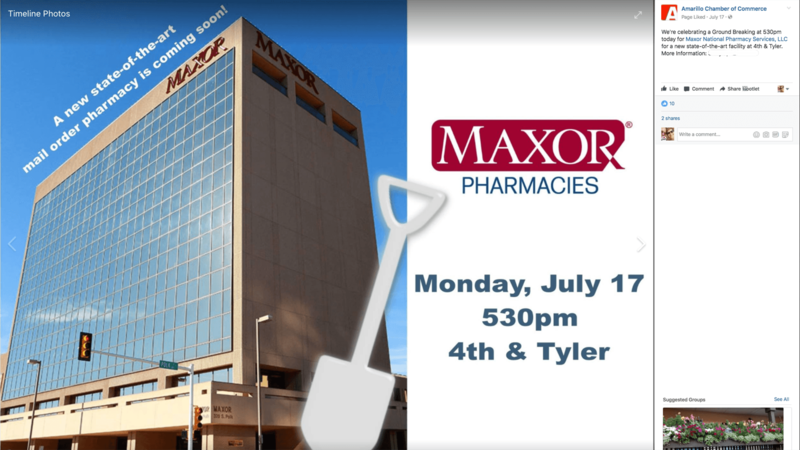 Maxor National Pharmacies has launched construction of a state-of-the-art prescription mail-order facility in downtown Amarillo. The 28,000-square-foot facility will have the capacity to fill as many as 20,000 prescriptions per day, according to Maxor's announcement. An email requesting comment from company Chief Commercial Officer Eric Wan was not immediately answered. Plans call for the plant to use advanced pharmacy automation systems, including a robotic prescription dispensing device. Amarillo Chamber of Commerce social media posts show representatives of Maxor, the chamber and other organizations took part in a groundbreaking for the facility at 5:30 p.m., Monday, at Southwest Fourth Avenue and Tyler Street. The facility should open in April 2018, according to a news release from the pharmacy and healthcare services company. A $13-million incentive package from the Amarillo Economic Development Corp. provided support to the expansion, according to President and CEO Barry Albrecht. Maxor's release said the project is part of growth Maxor is seeing in its MaxorPlus Pharmacy Benefit Management Business. The package approved by the AEDC board of directors and the Amarillo City Council offers "support for 200 existing jobs and an expansion of 375 jobs, all with an average salary in the high $60s ($60,000)," Albrecht said, "which is about $20,000 above the average salary in Amarillo. That's a big increase." The AEDC incentives for Maxor include a $5.5 mllion grant to help retain for 20 years Maxor's existing 220 employees, who share in a payroll of nearly $14 mlllion annually. And, under the agreement, Maxor could receive an additioanl $7.5 million if it creates 375 new jobs with corresponding payroll of $25 million.The AEDC board approved the package on April 18, and the council followed wiith its approval May 2, information from the economic development corporation said. Founded in 1926, Maxor remained headquartered in Amarillo and under local ownership until early 2014, when Beecken Petty O'Keefe & Co., a Chicago-based private equity firm, purchased the majority of the company.